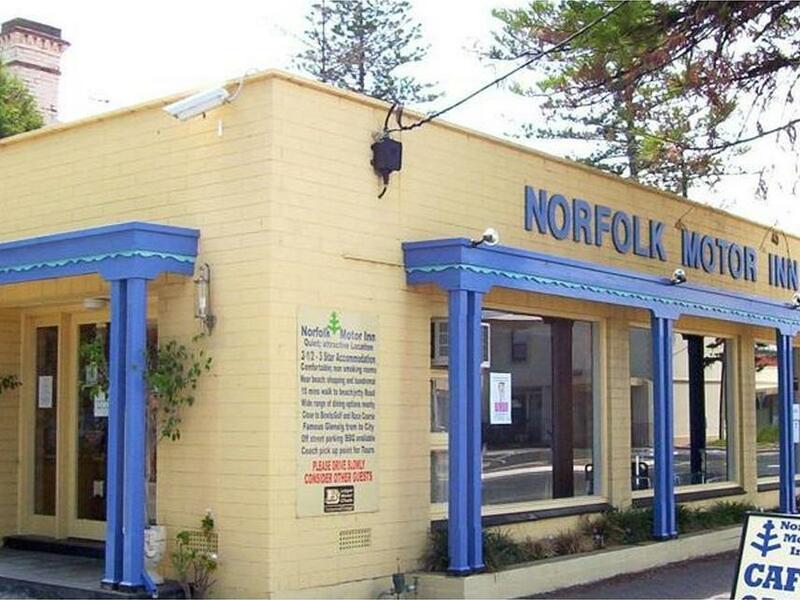 يقع Norfolk Motor Inn على بعد 3 دقائق بالسيارة من المحلات التجارية والبارات والمقاهي والمطاعم في Glenelg، ويوفر خدمة الواي فاي المجانية ومواقف سيارات مجانية. يمكن للضيوف استخدام منطقة شواء في الهواء الطلق ومرافق غسيل الملابس. كما تتوفر خدمات استئجار الدراجات، ويمكن لمكتب الجولات السياحية ترتيب رحلات سياحية إلى وادي Barossa أو Adelaide Hills أو وسط مدينة أديلايد. تحتوي كل غرفة مكيفة في Norfolk Motor Inn Glenelg على جهاز تلفزيون رقمي بشاشة مسطحة وراديو وثلاجة صغيرة وغلاية ومحمصة وميكروويف وحمام خاص. كما يتم تقديم وجبة إفطار كونتيننتال، ويمكن للضيوف تناولها في الغرف. يقع Norfolk Motor Inn على بعد 10 دقائق بالسيارة من West Beach. ويبعد مسافة 15 دقيقة بالسيارة عن مطار أديلايد الدولي و25 دقيقة بالسيارة عن وسط مدينة أديلايد. أما Aquatics Swimming Centre at Marion الذي يستضيف البطولات الرياضية والأحداث الوطنية فهو يقع على بعد 4 كم. يرجى من الضيوف إعلام الفندق مسبقاً بموعد وصولهم المتوقع قبل 7 أيام على الأقل من الوصول. ويمكنهم الإشارة إلى ذلك في خانة الطلبات الخاصة عند الحجز أو بالاتصال بالفندق باستخدام بيانات الاتصال الواردة في رسالة تأكيد الحجز. يرجى الملاحظة: سيتم تطبيق رسم قيمته 3.5% عند الدفع ببطاقة الائتمان أمريكان إكسبريس. يرجى الملاحظة: سيتم احتساب رسم قيمته 1.5% عند الدفع بواسطة بطاقات الائتمان فيزا أو ماستركارد. Great staff, friendly, helpful. Great value for money. Excellent stay, great value for money, excellent location, friendly staff and clean rooms. Excellent staff, friendly and helpful. Clean, tidy and spacious rooms. Great location and excellent Value for money. It is within walking distance from Glenelg Jetty and Jetty Road. Stay was really good. Staff were really friendly & helpful on arrival. Location is great, lots to see & do newrby but out of the way of the busyness. Rooms are basic but pefect for all we needed. Although only there for 1 night - we greatly appreciated the efficiency,helpfulness and overall attitude of the Manager and staff at this motel. Just arriving back from overseas we only needed somewhere to rest for the night and the room met our needs quite adequately. It was clean and very comfortable with everything we needed. The location is great too with a number of very good cafe's within a short walking distance. I would definitely stay there again. Thankyou. We let them know we would be arriving late from the airport and they made special arrangements for us. The room was small but well set up, the beds comfortable and everything clean and tidy. Good location room is clean. It is the first time I stayed here and I was really happy of the outcome. It is near the jetty and walking distance to my dental appointment. Pita was very helpful and nice to deal with. I will surely stay here again. ten mins walk to beach or town,half hour by tram to city. Good location.Microwave kettle fan fridge laundry room etc very relaxing stay. Daily room service; proximity to beach and shops; value for money. Comfortable with clean large room, and good buffet breakfast on request. I enjoyed the fact thta it was only a short walking distance to Jetty Road and Glenelg beach/pier. My only issue was that some guests were quite rowdy around midnight/early morning on some days, which was obviously quite inconsiderate.